Get ready to hit one out of the park with these assorted baseball cupcakes! The "official" ball was caught at a Rockies/Padres game last summer and is one of my son's prized possessions. 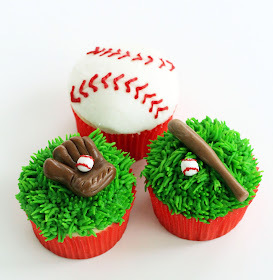 With baseball season well under way, learn how to make baseball themed cupcakes to take to your little leaguer's game this season. The gloves and bats are molded from Tootsie Rolls. 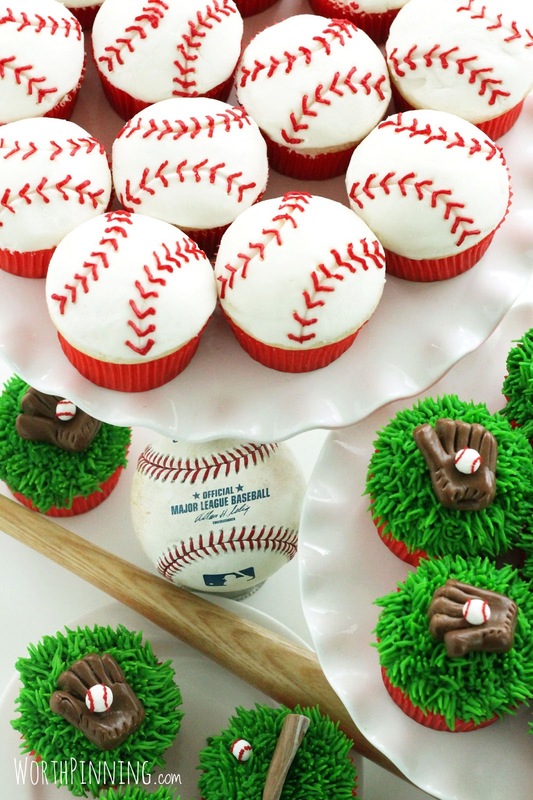 The mini baseballs are made of gum paste. Baked just right for 14 minutes. I had a bag of Valentine's Tootsie Rolls left over from Valentine's Day. Actually, I stashed them somewhere and forgot where I put them. The Tootsie Rolls had three sections and I used two per glove. Break off two sections and hold in your hand until the Tootsie Roll warms and is easy to bend/shape. The cupcake on the left is smoothed after icing the cupcake on the right. Half of the cupcakes were covered with white frosting and the other half was piped with green using a Wilton #233 tip. Place the gloves/balls and the bats/balls. The bats were made by kneading Tootsie Rolls and gum paste together and then rolling- thick on one end and thin on the other end with a knob for the bat handle. 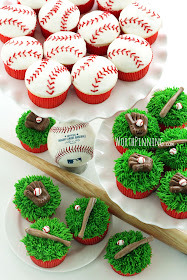 Place red frosting in a Ziploc bag and make a very tiny snip at one end to pipe ity-bity stitching on the mini-baseballs. To pipe the red laces on the baseball cupcakes, take a round cookie cutter and press it into the frosting for each side of the laces. Then poke small holes using a tool or toothpick for the laces to "insert". Last, pipe a "v" to connect the dots. Flip the cupcake around and repeat for the other side. 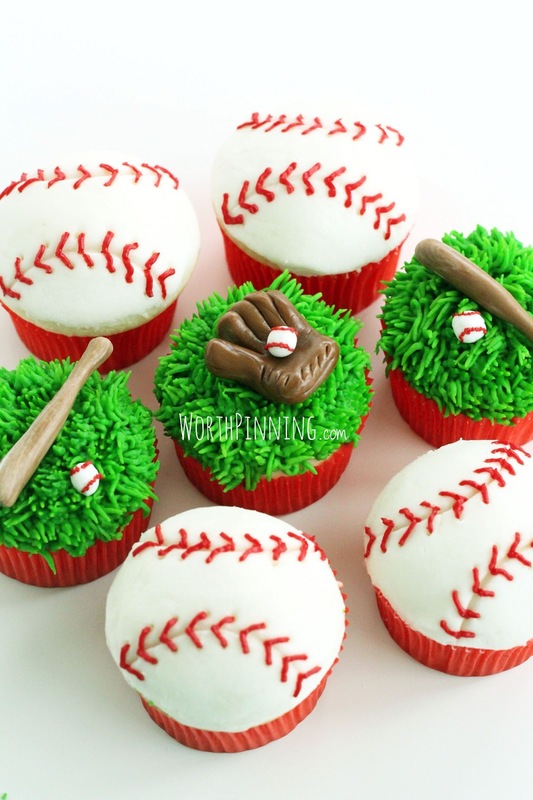 The indentations in the frosting help you achieve a more realistic baseball rather than piping two red lines down each side and then piping the "v"s.
Serve these during a 7th inning stretch and you're sure to be a fan favorite. For more cake and cupcake creations, click the "cakes" tab above. Those are so cute! You are so creative. Thanks so much for linking up with us at the Let's Get Social Sunday. Have a wonderful Sunday! What adorable cupcakes! I love them...and how creative to use the tootsie rolls for the bat and mitt. Pinning this! How creative! They look absolutely perfect. These are amazing! I love love love them!!! I am visiting from the Show Me What Ya Got link party! Wow great job! Almond flavored cupcakes? Never heard of that! They look great. If only there was a "click to smell" button on here. These are so dang cute! I am pinning them for my grandson's baseball team. Maybe I'll have to be the cool grandma one week and take the treat! Such a cute idea and soo creative! Thanks for sharing! these look great and so realistic and i love its not fondant! and i love tootsie rolls for making decorations too, it works out so well! Carrie these are ADORABLE! My littlest is crazy about baseball and he's only 2; I will have to pin this for a birthday theme sometime! They turned out SO cute; great job! You are a Featured Favorite this week on Saturday Show & Tell on Cheerios and Lattes! Thanks for sharing with us last week, we can't wait to see what you've been up to this week! Have a great weekend! I LOVE these details! so perfect! Any little boy would love these! Thanks for linking up at Pint Sized Baker's Two Cup Tuesday Party! I've pinned this! I hope to see you again on Monday Night! Super cute! I love these! I wish my sone was still in Little League! I need a reason to make these! Phenomenal as always, Carrie! I have a baseball-crazed 7-year-old who would go ga-ga for these! How did you smooth the frosting? Great question- the buttercream frosting I make isn't a sticky frosting. If you allow the cupcake to sit for a few minutes, the buttercream gets a very light crust to the top. I either hand smooth or place a paper-towel (one without texture like Viva) and smooth with a spatula. It makes the frosting look more like fondant. I am going to attempt to make these cupcakes for my son's t-ball party. Would you mind sharing your buttercream frosting recipe? Thanks for sharing such creative cupcakes! I desperately want the recipe to that white frosting, and step-by-step instructions. 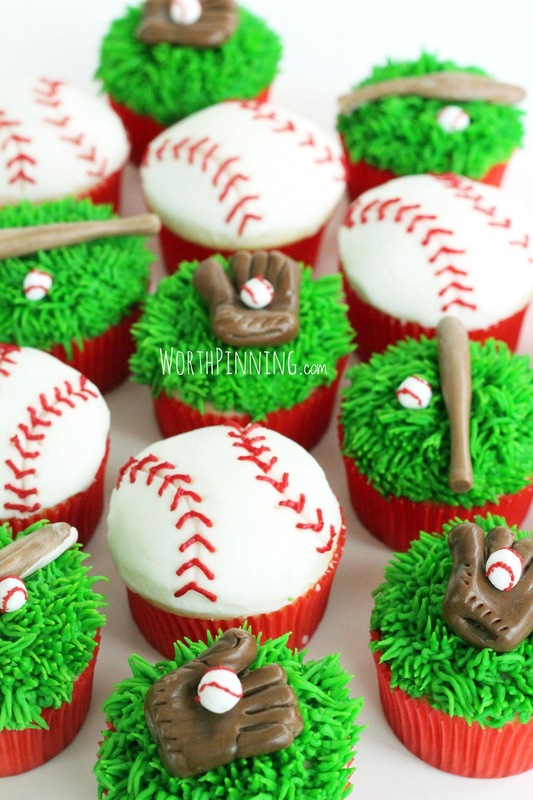 :-) I have a boys baseball team party this weekend! Help! These are SO clever. I'm a big baseball fan, so anything related to the sport gets my attention. What fun to make these baseball cupcakes for a sports get-together.